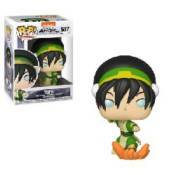 HOME > AVATAR THE LAST AIRBENDER - TOPH POP! AVATAR THE LAST AIRBENDER - TOPH POP! AVATAR THE LAST AIRBENDER - SOKKA POP! AVATAR THE LAST AIRBENDER - ZUKO POP! AVATAR THE LAST AIRBENDER APPA POP!